The North Lane slaughterhouse was one of several Victorian slaughterhouses in Yeovil town operating chiefly in Victorian times. There was another one just around the corner in Vicarage Street, on the south side opposite the chapel and a third behind houses on the north side of Middle Street, opposite Union Street. 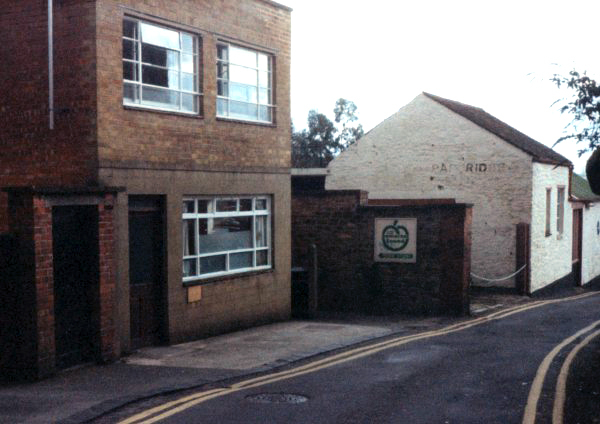 The North Lane slaughterhouse was in North Lane opposite North Lane House and at the entrance to the conveniently close animal market at Fair Ground. An indenture of 1751 describes it as a "Messuage or Dwelling House lying near the Church Hatch in Yeovill commonly called Crocker's Hatch containing a Hall Kitchen Shop and Slaughter House with the Chambers over the said Roomes with the Outhouses and Garden Plott thereto belonging now in occupation of Thomas Francis." It was still operating in the 1880's and is described as such on the 1886 Ordnance Survey however in the 1901 census, although still called North Lane Slaughterhouse, it was the residence of chartered accountant Thomas Denman and his wife Mary, together with a cook and a housemaid. In fact it returned to being a slaughterhouse well into the twentieth century, finally closing (I think) in the 1970s. Colin Haine, who supplied me two of the photos in the Gallery below was a slaughterman there for many years. On the corner of the slaughterhouse, at the entrance to the animal market in Fair Ground off North Lane, was a public drinking fountain. The site of the slaughterhouse is now residential flats. 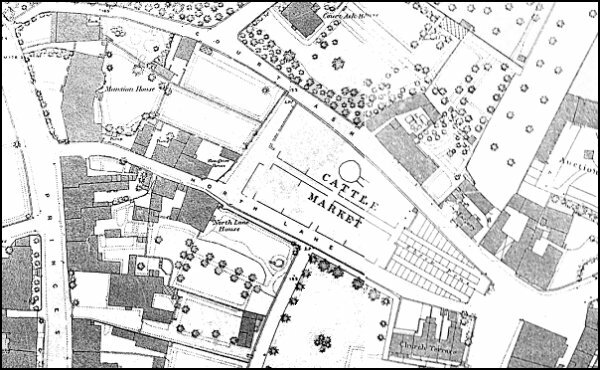 The 1886 Ordnance Survey showing North Lane slaughterhouse, left of centre, at the western entrance to the cattle market from North Lane. 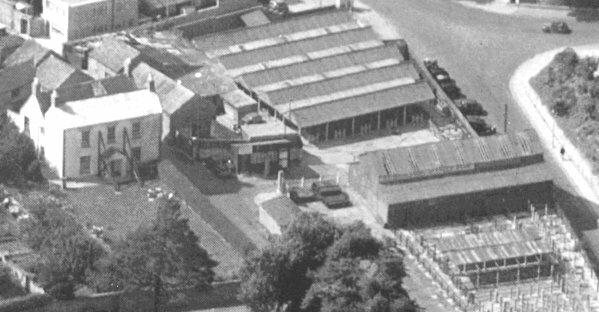 An aerial view, taken in 1955, of North Lane slaughterhouse left of centre between North Lane House to its left and the animal pens of Fair Ground to its right. At far right is Court Ash and the entrance to Court Ash Terrace. The white buildings in North Lane at right, seen from close to the junction with Princes Street, were part of the slaughterhouse, replaced in recent years by yet another block of flats. Photographed in the mid-1980s. 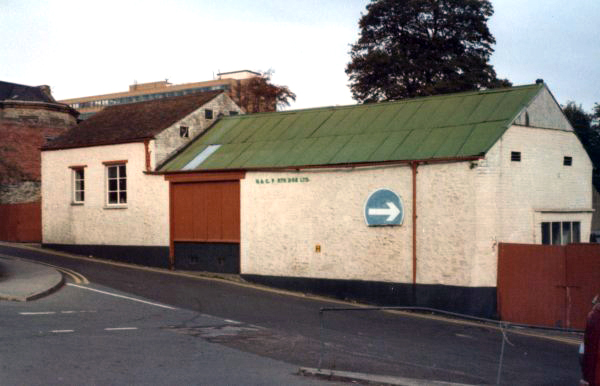 The old North Lane slaughterhouse buildings photographed in the 1980s from the North Lane car park. 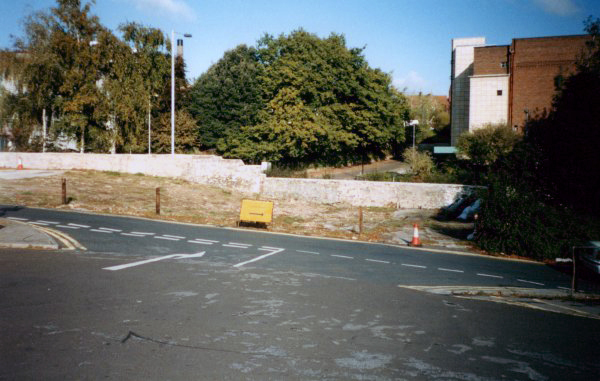 At this time the buildings were the premises of N & G Partridge Ltd.
.... and then it was gone. Seen from the North Lane car park.